Representative in Europe, CAF-Development Bank for Latin America. José Antonio García Belaunde, Minister of Peru’s Foreign Affairs for 5 years, has been appointed as CAF representative in Europe. The executive president of CAF-development bank of America Latina-, Luis Carranza, appointed José Antonio García Belaunde as new representative in Europe, to succeed Colombia’s Guillermo Fernández Soto, who was appointed as the new Colombian Ambassador to the United Nations last October. A career diplomat and Minister of Foreign Relations of Peru from 2006 to 2011, Garcia Belaunde optimized relations with neighboring countries during his tenure. In addition, he launched the Pacific Alliance and promoted the negotiation and signing of trade agreements and the completion of negotiations for the Trade Agreement with the European Union and the approval by the US Congress of the United States-Peru Trade Promotion Agreement (TPA). As part of his extensive diplomatic career, Garcia Belaunde has served until recently as Ambassador of his country to the Kingdom of Spain. He was also representative in the Latin American Integration Association (ALADI) and served in the embassies of Peru to the United States of America, Ecuador, France, Mexico, and the representation to the United Nations in New York. 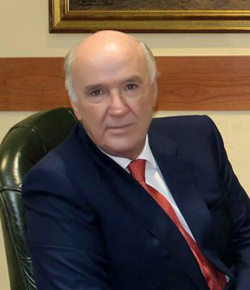 In the academic field, Garcia Belaunde has been Professor at the Institute of Governance of the University of San Martin de Porras and the Diplomatic Academy of Peru. He holds a Master’s Degree in International Law and International Relations from Instituto Ortega y Gasset, and a graduate diploma from the University of Oxford.